Chicago is not only famous for its contributions to jazz and the blues: it has also been a hotbed of R&B. And one of the many soul talents who came out of the Windy City was Keni Burke, who first made a name for himself as a member of the Five Stairsteps. Best remembered for their 1970 hit “O-o-h Child” (which made it to #8 on the Billboard Hot 100 and #14 on Billboard’s R&B singles chart), the Five Stairsteps were very much a family group: all five members (Keni, Clarence Jr., Alohe Jean, James and Dennis) were siblings. They were managed by their father, Clarence Burke, Sr. (a detective for the Chicago Police Department who played bass on the side), and their mother, Betty Burke, was the one who came up with the name Five Stairsteps. Keni (born September 28, 1953) was only 12 when the group was formed in 1965 and was in his early 20s when the Five Stairsteps broke up in 1976, which was the year before he began recording as a solo artist. Released by ex-Beatle George Harrison’s Dark Horse Records in 1977, the self-titled Keni Burke was his first solo album. Keni was musically reunited with three of his brothers (Clarence Jr., James and Dennis) in an early 1980s group called the Invisible Man’s Band, which also included keyboardist Dean Gant. IMB’s disco-funk didn’t sound anything at all like the Five Stairsteps, but that didn’t prevent their 1980 single, “All Night Thing,” from becoming a major hit and reaching #9 R&B in Billboard. 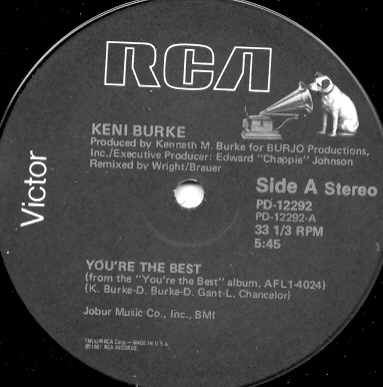 IMB’s self-titled debut album of 1980 was released on Island’s Mango imprint, but when Keni resumed his solo career, he did so at RCA Records—which released his second solo album, You’re the Best, in 1981. The musicians who join Keni on You’re the Best include, among others, Gant, Keni’s brother Dennis Burke (who plays guitar on some of the selections), percussionist Leon “Ndugu” Chancler (known for his association with the late George Duke), Gil Askey (who helps with some of the string and horn arrangements) and Gil’s daughter Day Askey Burke (who was Keni’s wife at the time and contributes background vocals). Guitarist Michael Thompson (born February 11, 1954, Brooklyn, NY), who is heard on “Love Is the Answer” and the title track, has fond memories of working with Keni in the early 1980s. Thompson, a major session guitarist, has played with everyone from Babyface, Anita Baker and Mariah Carey to Madonna, Neil Diamond, Cher, Phil Collins, Celine Dion and Christina Aguilera over the years. But back in 1981, he was still struggling—and playing on You’re the Best was an opportunity he jumped at. Thompson, now 59, moved to Los Angeles from the East Coast in 1979. His wife Gloria found a job as a receptionist in an L.A. law firm, where Day was one of her co-workers. After Gloria told Day her husband was a guitarist, Thompson was introduced to Keni and ended up playing on You’re the Best. After You’re the Best, Keni recorded one more solo album for RCA, 1982’s Changes, before recording 1998’s Nothin’ But Love (his most recent solo album) for Expansion Records (a British label) in 1998. Sadly, Keni’s brother Clarence Burke, Jr. died in May 2013 at the age of 64. But Keni, now 60, is alive and well and living in Atlanta.